My reflection on current events regarding policy, the environment, and culture related to food. To put it bluntly, we’ve become a culture that values money, efficiency, convenience, and have tied those values to how we buy, make, and eat our food. And it’s not completely our fault. This is not say we don’t value food at all, we just value it in a very different way and have in some way been influenced to be this way. Cooking, although not a forefront message in the film, was strung along each topic of discussion alluding to how making our food pre-prepared, easy to make, convenient, and therefore heavily processed has made it so our society has bought into “not wasting our time” preparing the foods we eat to nourish ourselves. I constantly read about how much our food environment is affecting the way we eat and now having watched this documentary and listened in on a discussion between Michael Pollan, Marion Nestle, and the film makers, it’s clear to me that our food environment is really heavily tied to our culture. So, what is the current value of food in our culture? To me, food in the United States has lost it’s way and has been overtaken by stakeholders who don’t have the best interest in how food should be produced, and treated if you will. It may seem like a strong statement to make, but food has been disrespected for far too long in this country. But who is to blame, why did we let it get this far? This leads me to another important and complex issue. 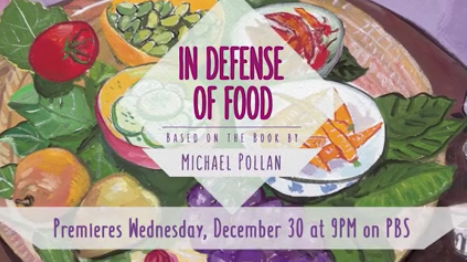 In the film, In Defense of Food, Michael Pollan took his viewers through a look back at this history on how the industrial revolution and technology advancements made it so processing food was more efficient ly done. These advancements led to bigger sales of processed food, increased affordability of foods, extended the shelf life of foods, and most importantly, it decreased cost of production for companies (more money for them!). Food marketing also became a huge component of our food environment early on in the 1900s, specifically when Kellogg’s Corn Flakes cereal was first introduced in this country. This was one of the first companies to invest more heavily in advertising and marketing strategies in order to help increase sales of their product. Did people know they were being heavily influenced to purchase a product? I know growing up in my household my parents never fell for any food marketing schemes, but I do remember them being swayed by the occasional infomercial on how to lose weight without lifting a finger. People and individual choice are not solely to blame and yes, of course, companies are not to blame 100 percent. But companies cannot continue to shift the focus on the individual when clearly they are spending billions of dollars on research and marketing to influence consumers to continue buying their food products, or as Michael Pollan calls them their “edible food-like substances”. In my opinion, food marketing has reached the point of forgetting that what they are promoting for sale has an effect on a consumers health. The food or edible food-like substances we eat have an impact on our health – it’s that simple. To keep telling people to buy more of it, buy in bulk, stock up on your favorites, bigger is better, get more for you money, and so and so on, is just utterly irresponsible and it completely goes against their own argument in saying people can make their own choices. At the level of influence these companies have on consumers, can people really make their own choice? I would say I am a well informed consumer and I’ll admit I fall prey to some of their tactics. It is almost impossible not to unless you avoid shopping at supermarkets in-store or online . On top of this the fast food industry adds another layer of food marketing bombardment to people with TV commercials in addition to the processed food marketing already present in grocery stores. This all goes back to really thinking about the value food in our everyday lives. What does it mean for us to value the food we eat, to respect it, to treat it as it should be and not to process and strip it of all it’s natural goodness to then replenish it back with all the good stuff, present it in a more cost-efficient, stable, and more marketable form just so companies can put more money in their pockets. For the majority of our food, this is what food has become – edible food-like substances. The need to eat real food along with the time needed to cook has lost value. With it, sadly, our culture has also been stripped of a very important component crucial for the well being its people. There is a lot of good work being done all across the country to help reverse the state of our food system and ultimately to revive the value of food in our culture. Schools are implementing more innovative nutrition and health programs, consumers are demanding more transparency in food labeling, beverage companies are seeing declining sales of calorie ridden beverages, and overall people are beginning to realize that locally grown food tastes better and is better than mass produced food. Personally, I am very excited about continuing the good work of getting the message out about improving our food systems and the way we purchase and eat our food. We are most certainly experiencing a food revolution, one that will take hard work, dedication, commitment, and patience. I am thankful to Michael Pollan for his film and for reminding me and everyone else who was in attendance about how important real food is, and how it really is such an important cultural component of our everyday lives.